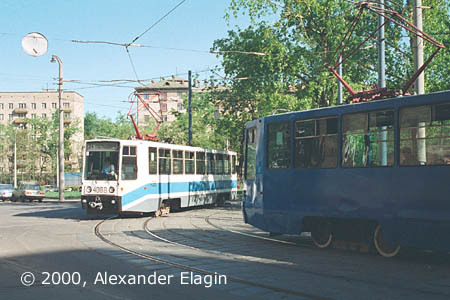 Abelmanovskaya Zastava Square is one of the key nodes of the Moscow tram system. 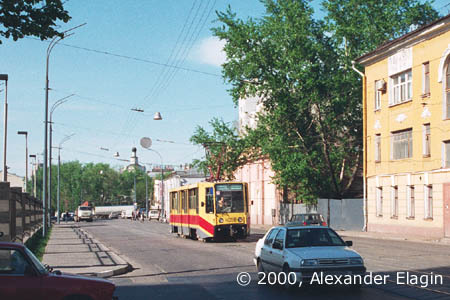 Four tramlines meet here, and most tram routes of the South-East of Moscow cross this square. Unfortunately, the square is a key node for car traffic, too, and trams began to stuck in traffic here. The situation had become catastrophic by early 2000's when tram and car jams were almost regular and lasted for many hours, with dozens of trams batched in stillstands. Lately the problem has become less severe as the jams moved farther to a newly built intersection where no trams run, and today Abelmanovskaya Zastava is again just a busy square. With trams which have survived the heavy times. Abelmanovskaya Zastava Square has changed much during the last decades. There have risen new high buildings, the car traffic increased in times. But the tram remains a remarkable part of the square. 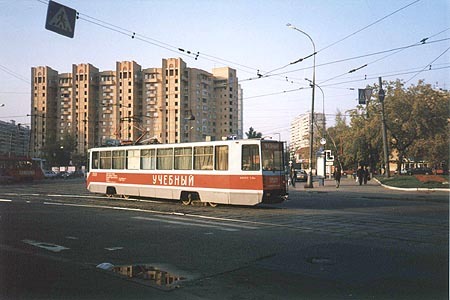 This tramcar is making for Rogozhskiy Val street from Bolshaya Kalitnikovskaya street. Having passed a little from the square along the Rogozhsky Val Street, the tram line forks. One branch continues along Rogozhskiy Val while the other turns to Malaya Andronyevskaya Street. 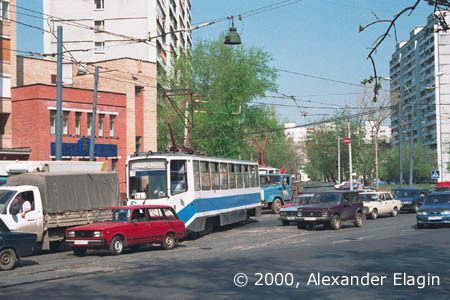 Here you can see this junction and a queue of tramcars heading for the Abelmanovskaya Zastava. This crossing without any traffic lights is the main reason for tram problems in this district, as the motorcars are reluctant to give priority to trams. This is a crossroad of Malaya Andronyevskaya and Trudovaya streets. The buildings along the Rogozhsky Val Street loom in the background. This is a building of Rogozhskaya power substation that stands on a corner of Bolshaya Andronyevskaya and Shkolnaya streets. 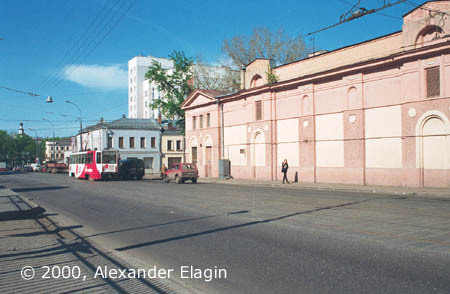 This substation was built in 1909 specially for tram, and it still continues to feed the tramway and trolleybus of Moscow with electric power.